Venice. What a magical place! Our guidebook used words like crumbling and romantic and watery when describing Venice, and they are well-chosen. Italy in general has an incredibly high bar set for it by literature, history, and former travelers who remember everything in a rosy haze. It's hard for Italy to actually be so otherworldly in its romantic perfection for the average traveler. However, I will say simply that Venice surpassed my expectations, surprising me again and again by its tenacious ancient beauty. Before the photos, a bit about where we stayed. 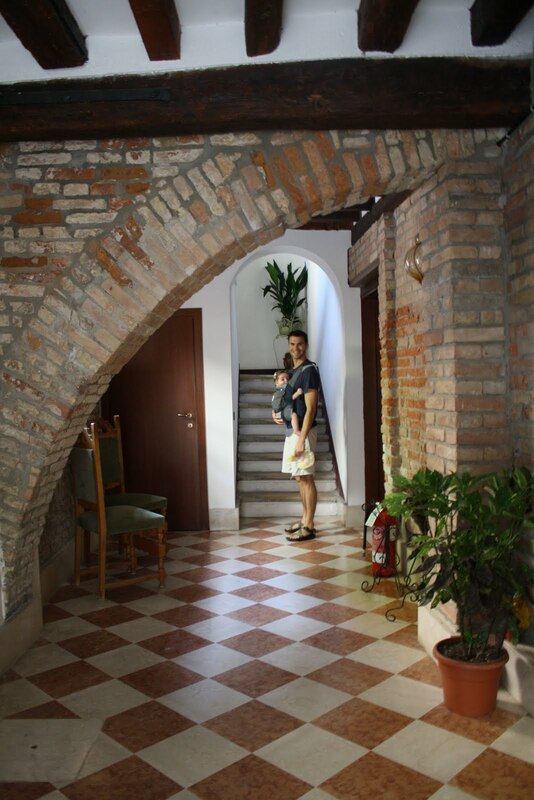 In general, Elliott and I (and now Baby too) travel on a budget. OK, a tight budget. Often we CouchSurf while traveling because it's free and we can meet friendly residents of whatever city or country we're visiting. However, there were no CouchSurfers in Venice (! ), and we realized this is because the hosts would probably have visitors 24/7. Venice itself is tiny and thus most tourists pay $100+/night to stay in the city or else take a train or boat to a nearby island or city for cheaper lodging each night. We knew that it would be difficult to explore all day with a baby, though, and that we'd be tired by about 3pm and ready for naps all around. But then Elliott found a studio listed on airbnb.com. 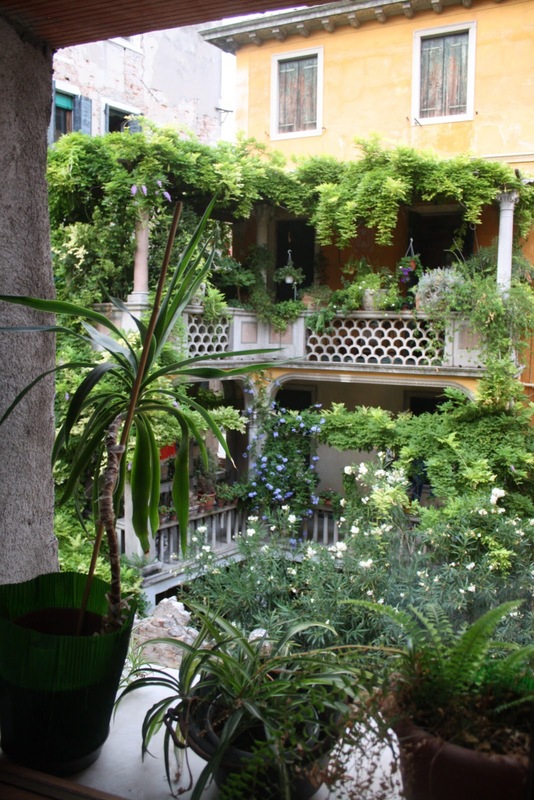 It seemed too good to be true: a whole apartment in the heart of Venice for just US$89 a night? When a hotel room in the summer season would be over US$150 a night? We'll take it! The owner of the studio met us at the vaparetto (boat bus from the mainland) and walked us through the winding streets to our apartment. I was dragging a duffel bag and had completely forgotten that Venice was full of canals, and people ride in boats on the canals, and thus the bridges have to arch up, and arched bridges are kind of hard to get a heavy duffel bag over. I huffed and puffed and tripped to the studio because I was too busy eagerly craning my neck in every direction. The apartment is located on a quiet street in a very residential area of Venice. We liked the lobby. ... and there was the apartment! By "studio" the owner meant "office" because he uses it during the week to see patients. However, it's a regular apartment with a large bathroom, bedroom, living/dining room, and kitchen. We put down our bags and looked out the bedroom window. And hello what a view across the street! Our neighbor proceeded to dry all her lingerie this way all weekend. Lena settled in, happy as could be. We were fascinated by the psychotherapist's book collection. Do you see the complete works of Freud? 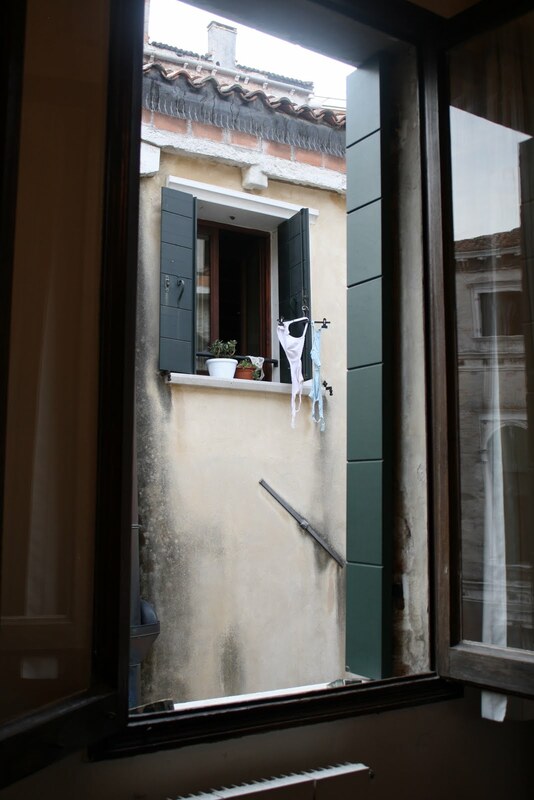 Our favorite part of the apartment was the kitchen window, which looked out over one of the canals. 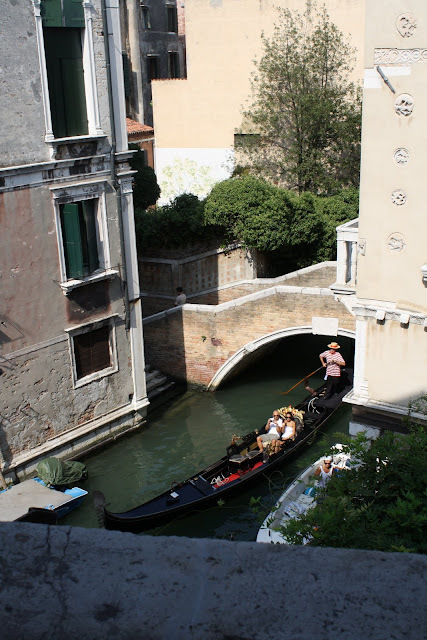 One of the first times I stood leaning out the window I saw this gondolier passing by, calling "Oiii!" to alert boats ahead as he poled through the water. We settled in a bit and studied the map to get our bearings. And then we set off into the Venetian sunset to find some supper. We decided upon a pretty little restaurant by the water on the northern edge of Venice. Lena was getting tired so I rocked her to sleep in my arms. But of course as soon as I tried to lay her gently down on a pad of blankets, she woke up. And studied that pizza, hoping to get a taste! She's so ready to eat real food. After dinner we walked home in the quiet darkness, hand in hand. We had three days of discovery ahead of us, and famous wonders like Saint Mark's Square and the Doge's Palace and the Rialto Bridge awaited us in the morning. More photos of the weekend tomorrow! The picture of the courtyard with the green is soso pretty! And looks like Lena is already working on her beer belly...definitely got some rolls of fat there. 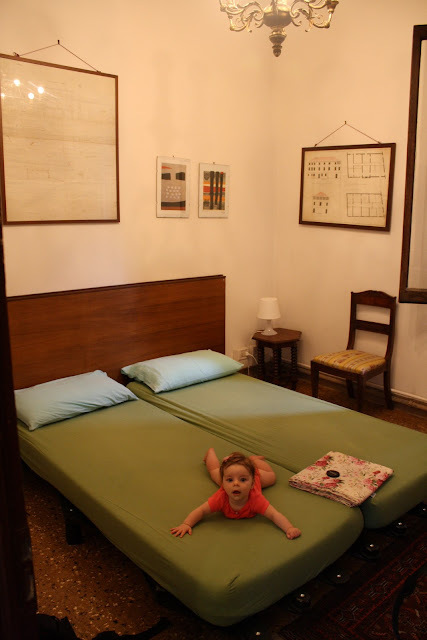 But haha the one of her on the bed is awesome. Thanks for sharing such beauty Becca. What a joy to see your precious family!